The Huskies celebrate their Canada West semifinal win. 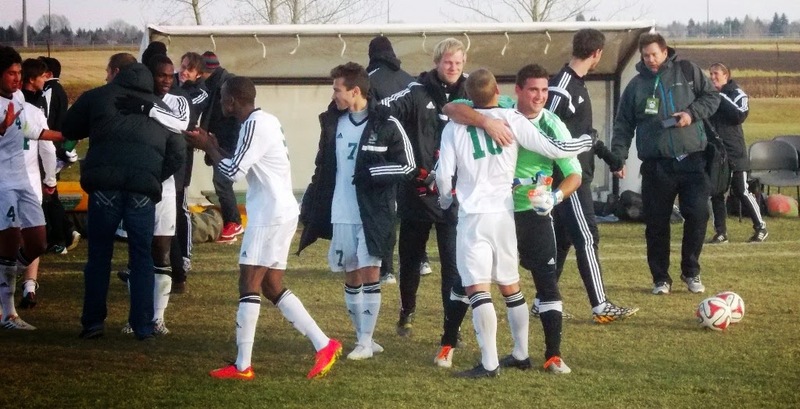 The dream season for the University of Saskatchewan Huskies Men’s Soccer team marches on. On Friday at PotashCorp Park, the Huskies, who were hosting the Canada West final four tournament for the first time ever, downed the University of Victoria Vikes 2-0 in a semifinal match before a healthy gathering of spectators. With the win, the Huskies, who have never won a Canada West championship, will host the University of Alberta Golden Bears in the conference title game on Saturday at 2 p.m. at PotashCorp Park. For years, it seemed like a dream would be the only way the Huskies would ever have a chance to win Canada West title at home. This year’s powerhouse squad, which posted a program best 9-1-2 regular season record, is just one win from making that dream a reality. Against the Vikes on Friday, the Huskies pulled out a tight playoff contest by controlling possession of the ball. Garrett Peters scored at the 23rd and at the 30th minute to provide all the offence the home side would need. Michal Bandula picked up the shutout victory in goal for the Huskies, while Noah Pawlowski suffered the loss in goal for the Vikes. The Golden Bears claimed the other semifinal downing the defending national champions for the past two seasons the University of British Columbia Thunderbirds 2-0. The bronze medal game between the Vikes and Thunderbirds is set for 11:30 a.m. on Saturday. The Thunderbirds beat the Huskies in last year’s Canada West title game. During the regular season, the Huskies won both their encounters with the Golden Bears, which were held at PotashCorp Park. The Dogs claimed a 4-1 triumph on Oct. 3 and a 6-1 victory on Oct. 5 . Both the Huskies and the Golden Bears will advance to the Canadian Interuniversity Sport championship tournament, which will be hosted by the University of Prince Edward Island Panthers from Nov. 6-9 in Charlottetown. On Thursday, Huskies head coach Bryce Chapman was named the Canada West coach of the year, while forward Luigi Bekwayo was conference’s student-athlete community award recipient. Centreback Jordian Farahani and striker Brett Levis were named first team Canada West all-stars, while Bandula and Bekwayo were named second team conference all-stars. On the Huskies women’s soccer team, striker Jenelle Zapski and defender Jennifer Miller were named Canada West second team all-stars. 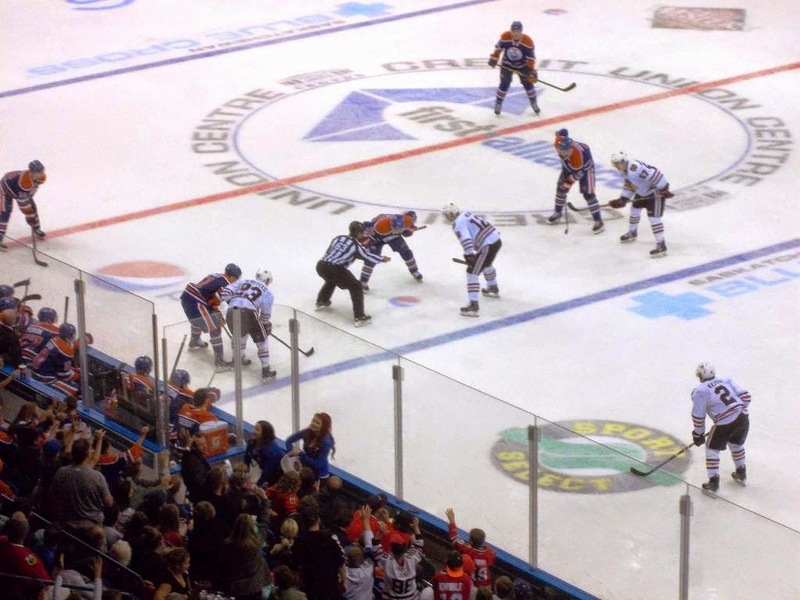 An NHL exhibition game held in Saskatoon in September. When it comes to sports media in Canada, it is all about the NHL. The only place that might not be true is Saskatchewan, where the CFL’s Roughriders are number one. In the consolidated media world that marks the landscape in Canada, the NHL is where it is at as far as sports coverage goes. As a result, coverage for all other sports ultimately suffers. As the media in Canada continues to consolidate, the various outlets end up looking to gain the biggest bang for the buck. The industry for all intensive purposes has been in a negative economy cycle for two decades going back to before the Internet became big, which has created the need to get the biggest bang for the buck. When it comes to covering sports, the NHL has a huge captive audience in Canada that isn’t going anywhere. If you produce anything on that league, you can be sure someone will read it, listen to it, or watch it. If media outlets in Canada really wanted to, they could likely get away with just running sports stories on the NHL. In Western Canada, you would still have to acknowledge the CFL, but the NHL rules the roost. I remember a conversation I had with an elite level goalie coach in summer. He said there seemed to be more media than ever circling around Canada’s NHL teams. That is likely true. Besides having the regular print, radio and television media following the team, you have personnel from NHL clubs themselves putting together stories and videos for websites. You also have people there from the league itself putting together items for various NHL run media platforms. Due to the overwhelming attention the NHL gets in Canada, regular media companies are hesitant to cut back coverage in that area. It is giving you the biggest bang for your buck. If you take away coverage in this area, you will lose a big amount of followers and the advertising bottom line gets hurt. When cuts do come down, it is usually at the expense of all other local sports. That is seen in various mid-market centres like Kelowna, Red Deer or Lethbridge where papers that once had sports staffs of three or four are shrunk to one or two. As most know, advertising dollars are usually sucked out of those communities to the head office of the consolidated media company. Red Deer actually once had a Global station, but that is gone. In Kamloops, you don’t even have a daily newspaper there anymore. The reason it is easy to cut sports coverage on the local level is because it takes a lot of resources to go out there and keep followers. Covering things like sports at the Canadian Interuniversity Sport level or sports at the high school level takes a lot of effort to get followers and keep them. In all reality, you are catering to a niche audience that doesn’t have a whole lot of room for expansion. In a ratio sense, a set amount of resources that would be used to cover the NHL will yield a much greater return than the same set amount of resources used to cover sports at the local level. With Postmedia Network Canada Corporation’s $316-million deal announced earlier this month to buy 175 newspapers and digital publications where the bulk of the deal included former Quebecor Media Inc. assets, local sports coverage will ultimately take another hit. Despite the cuts, almost all those that are actually on the front lines covering the local sports scenes in their various communities work very hard at what they do. In a lot of cases, they push themselves too hard to bring those stories to light and suffer burnout. In Saskatoon, the work that the sports media does in the city has to be rated as outstanding. The numbers in the sports media in town have shrunk, which seems strange for centre that has witnessed a population increase of about 50,000 people in the last eight years. It would be nice if media companies would increase the number of front line reporters in order to bring more local sports stories to the readers, or at least get numbers up to what they used to be a decade ago. There are a lot of good athletes with great stories working hard at what they do, and people don’t realize they are there. Unfortunately, it costs money to bring in more reporters and add resources to cover these stories. No consolidated media company would want to do that, when you can turn to the cash cow that is the NHL to make some easy coin. Goalie Cassidy Hendricks kicks out a shot for the Huskies. Well that was definitely the definition of team effort. 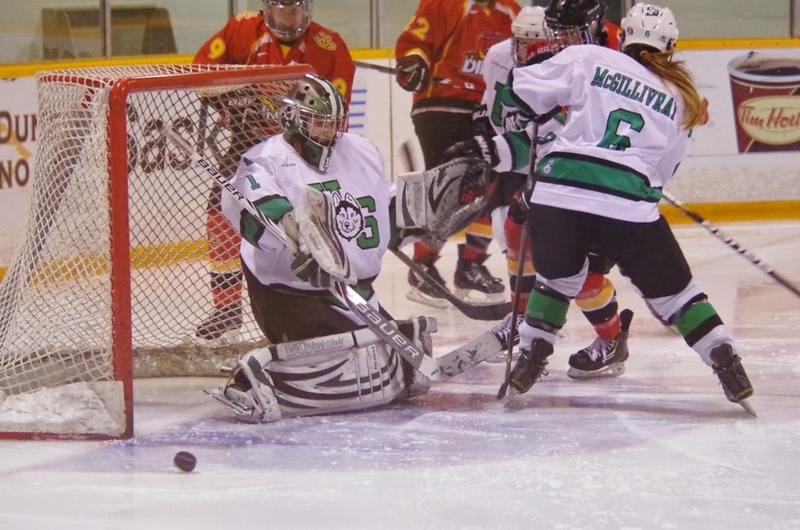 The University of Saskatchewan Huskies Women’s Hockey team was in top form on the weekend and passed a big early season test. Sitting with a 3-3 record going into the weekend, the defending Canada West champs faced a University of Calgary Dinos team that had some big additions from a season ago. The Dinos roster contained Canadian National team icon Hayley Wickenheiser and Russian national team standouts Iya Gavrilova and Alexandra Vafina. All three were not with the Dinos last season because it was Olympic year. Wickenheiser and Gavrilov helped the Dinos win a Canadian Interuniversity Sport title in 2012, while Vafina is in her first year of eligibility on the Calgary side. With that trio in the fold, the Dinos entered the weekend leading the Canada West standings with four wins and two overtime losses. Even with all those additions, the Huskies pulled out a sweep in a two-game series at the ancient Rutherford Rink. On Friday, the Huskies rallied from a 3-1 deficit to pull out a thrilling 4-3 overtime victory. Brown University transfer Lauren Zary potted the winner at 2:52 into extra time. On Saturday, the Huskies scored three times in the second period to go up 3-0 and cruised to a 3-1 victory. All of the Huskies forward lines and defensive pairings played strong system wise, forechecked hard and took away a lot of the passing lanes the Dinos thought they had, when they tried to work up ice. The hosts also played physical too. That was best shown when Huskies defenceman Brooke Mutch crushed Dinos forward Jenna Smith in the second period of Friday’s encounter. Mutch was given an elbowing penalty, but her team killed off the infraction. It also seemed to spark a turn of momentum in that contest. The Dinos led 3-1 at the time of the hit. When Mutch’s penalty was killed, the Huskies closed the second period scoring on a power play of their own, when fifth-year forward Kandace Cook tallied to make it 3-2. Edmonton product Rachel Johnson scored another Huskies power-play goal early in the third to knot things up at 3-3 as a prelude to Zary’s heroics in the extra session. Kaitlin Willoughby, who was the CIS rookie of the year last season, was huge for the Dogs offensively on Friday netting her team’s first goal and collecting two assists. The Huskies celebrate a Kandace Cook goal on Saturday. Cook and Zary scored again on Saturday, while Chelsey Sundby had her team’s third goal. Cassidy Hendricks kept adding to her reputation as a money goalie turning away 69-of-73 shots in the two contests. She also had a couple of key bailout saves on the weekend too. 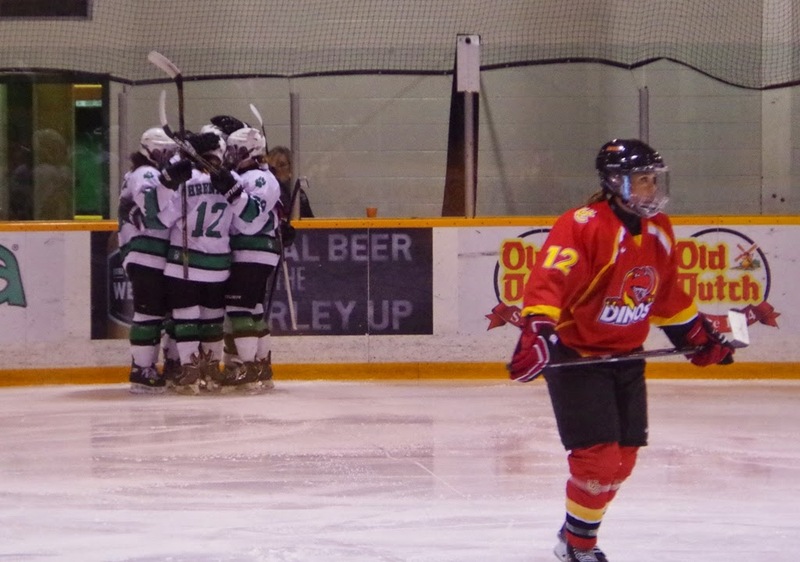 Dinos netminders Hayley Dowling and Carissa Fischer combined to turn away 60-67 shots over the two contests. Now 5-3, the Huskies have a bye week before traveling to Calgary to face the Mount Royal University Cougars on Nov. 7 and 8. NOTE – The women’s Canada West conference is using a news system for tallying points in the standings this season, which is similar to one used in the Olympics. Regulation time wins are worth three points, extra time wins two points and one point is awarded for an extra time loss. Under that system, the Huskies are currently fifth in the eight-team Canada West with 13 points. Keegan Arnyek (#16) returns a missed field goal for a TD. 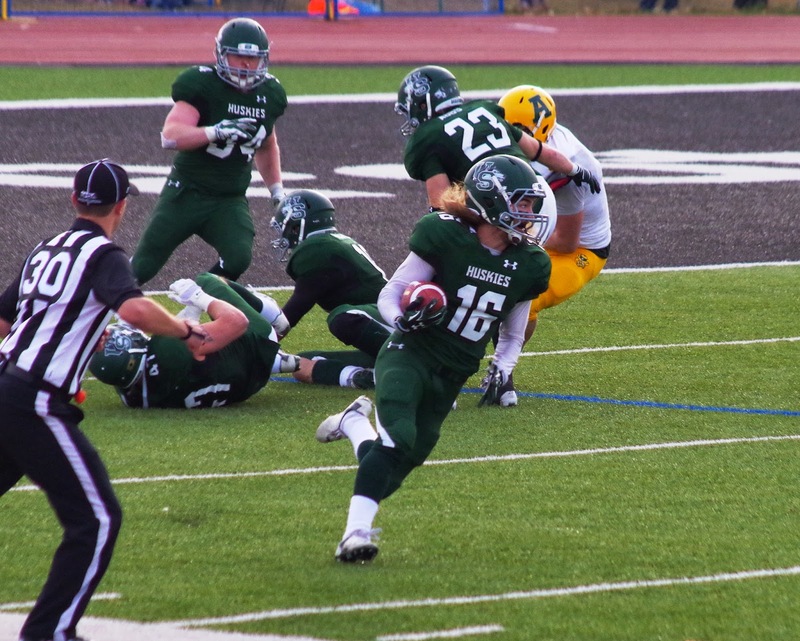 The U of S Huskies football team has a home playoff game in the bag. On Saturday, the Huskies locked up second place in Canada West with a 41-23 victory over the University of Alberta Golden Bears before 3,605 spectators at Griffiths Stadium. The win was a huge bounce back game for the Huskies, who were trounced 41-8 in their previous outing at the hands of the University of Manitoba Bisons in Winnipeg. The contest against the Golden Bears was close for a lengthy time, before the Huskies pulled away. Just past the midway point of the fourth quarter and the Huskies leading 27-17, the Golden Bears were attempting a field goal to cut the U of S lead to seven. The field goal was missed, and Keegan Arnyek returned the miss 116 yards for a spectacular touchdown. The return was aided by some huge blocks from Geoffrey Hughes and Mark Ingram. With the win, the Huskies improve to 5-2 and close the regular season traveling to Vancouver to take on the University of British Columbia Thunderbirds this coming Saturday. The Huskies will host a Canada West semifinal playoff game on Nov. 7 at 7 p.m. at Griffiths Stadium. Erica Hindmarsh in action for the U of S Huskies. 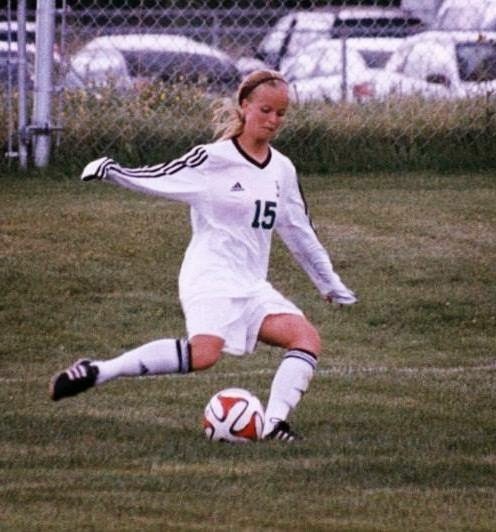 The U of S Huskies Women’s Soccer team made history on Sunday. The Huskies captured their first playoff win downing the MacEwan University Griffins 2-1 at PotashCorp Park. Carmen Gorlick and Erica Hindmarsh scored for the Huskies, while Cara Santaga picked up the win in goal. With the win, the Huskies advance to the women’s Canada West final four tournament, which opens this coming Friday in Langley, B.C. The Trinity Western University Spartans host the tourney, which will include the University of Alberta Pandas and the Fraser Valley Cascades. The Huskies men’s soccer team cruised to a 5-1 Canada West quarter-final victory over the University of Winnipeg also on Sunday at PotashCorp Park. Brett Levis scored twice for the Huskies, while Garrett Peters, Bobbi Nicholat and Sam Whiting all had singles. Michal Bandula picked up the win in goal. With the win, the Huskies will host the men’s Canada West final four tournament this coming Friday and Saturday. The tourney will include the U of A Golden Bears, the UBC Thunderbirds and the University of Victoria Vikes. The Hilltops celebrate with the PFC championship trophy. It was Sunday beautiful Sunday for the Saskatoon Hilltops. The venerable Canadian Junior Football League franchise had a day that was as picture perfect as the weather at the club’s long time home the Saskatoon Minor Football Field, which is formerly known as Gordie Howe Bowl. Quarterback Jared Andreychuk came out gunning the ball all over the field staking his club out to a 24-7 lead against the visiting Calgary Colts. The Toppers cruised to a 27-7 victory, which allowed them to capture another Prairie Football Conference title. With the win, the Hilltops advanced to the CJFL title game, the Canadian Bowl, on November 8 in Langley, B.C., against the host Rams. 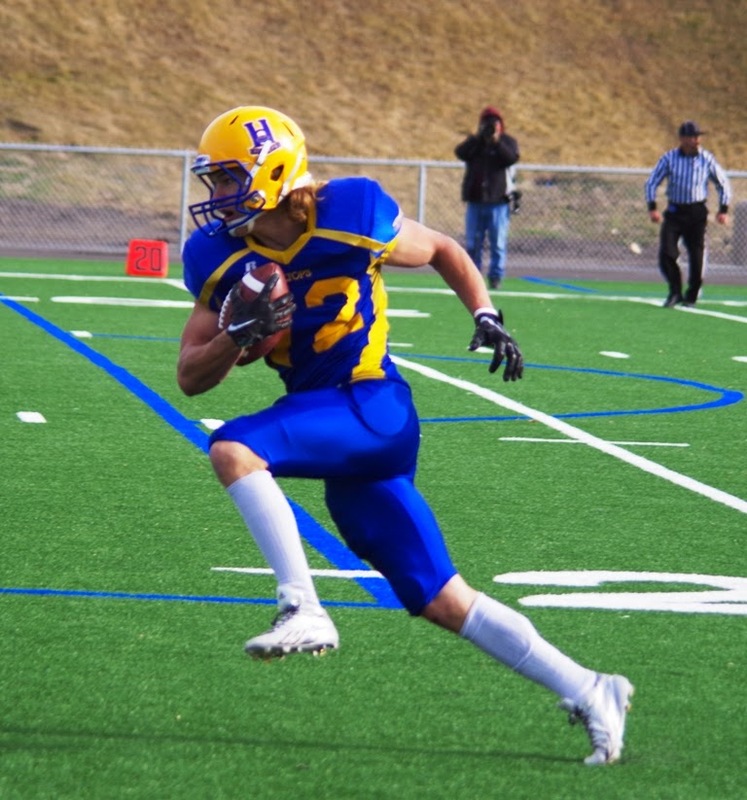 After starting the season 1-2, the Hilltops rolled into the PFC final riding a six-game winning streak. The Colts had won four in a row, so the two hottest teams in the conference were battling for spot in the national final. Calgary went 0-8 in 2013, which saw the club hire legendary British Columbia Football Conference head coach Matthew “Snoop” Blokker. Blokker guided the Colts to a 4-4 regular season record and a playoff win. Unfortunately for Calgary’s bench boss, Sunday belonged to Saskatoon’s stellar coaching staff. The energetic Tom Sargeant has been guiding the Hilltops as head coach since 1998. During his time, the team has won seven CJFL championships, and he has become the iconic standard to which all other Hilltops bench bosses past and present are measured. “The Sarge” has almost seen it all, and his teams always improve as the season goes on. When he comes out fired up for a practice or a game, it is hard not to get pumped up too. Sargeant always seems to know the right things to say. He has also surrounded himself with some outstanding coaches. One of the best known is defensive coordinator Jeff Yausie, who is the executive director of Football Saskatchewan and the head coach of the powerhouse Saskatoon Valkyries women’s football team. Yausie’s defences are always aggressive, tough and opportunistic when it comes to forcing turnovers. A key takeaway came on the Colts first drive of the second half. Calgary drove down to about the Saskatoon 11 yard line and was going for a quarterback sneak on a third-and-one gamble. At the time, the Hilltops led 24-7, but a Calgary major would make it game on again. Colts quarterback Brett Hunchak fumbled the ball away into the hands of a Hilltops defender to bring an end to the scoring threat. Saskatoon got a field goal on that cough up to go up 27-7. Evan Kopchynski takes off to score a first quarter TD. On the other side of the ball, offensive coordinator Sheldon Ball might be one of the more underrated coaches on the Saskatoon staff. “Coach Goose” had a masterful game plan drawn up, which allowed the offence to land a lot of huge early body blows. Andreychuk completed 20 of 31 passes for 329 yards and three touchdown strikes. The best throw was a 54-yard pass and run strike to Evan Kopchynski that put Saskatoon up 14-7 in the first quarter. The Colts managed to get a couple of picks including an acrobatic end zone pick by Dylan Niedermaier in the second quarter. Andreychuk wasn’t deterred and proceeded to calmly drive his squad. Running back Logan Fischer, who was filling in for injured starter Wayndel Lewis, rolled off 183 yards rushing on 28 carries. Fischer will have to carry the load again in the Canadian Bowl, as Lewis’s ankle won’t be healed up by that time. The offence showed huge improvement under Ball’s guidance, and his influence on Andreychuk, who showed really good vision on Sunday, was obvious. In the late 1990s and early 2000s, Ball quarterbacked the Hilltops and then the University of Saskatchewan Huskies, and he developed a great analytical understanding of the game during that time. With their outstanding coaching staff, the Hilltops will likely be favoured to claim their 17th CJFL championship in team history. 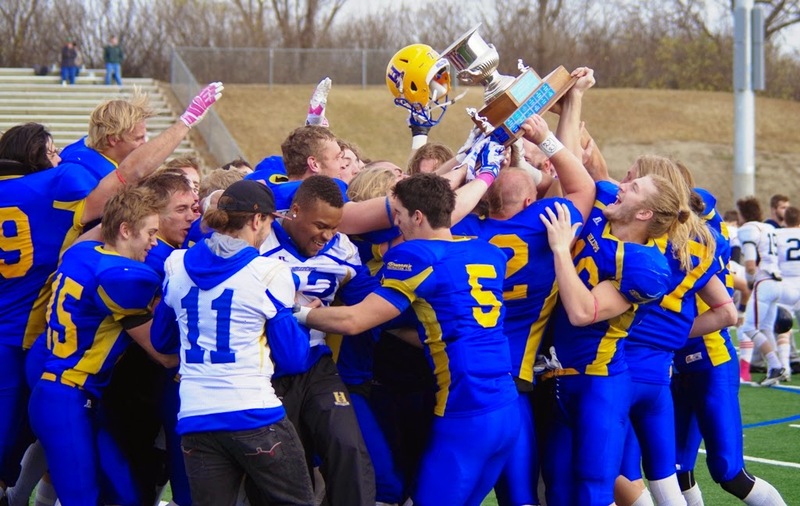 The Hilltops claimed their 16th CJFL title downing the Rams in Langley 23-21 in the 2012 Canadian Bowl. It seems like the blue and gold are in perfect position to add another sweet close to their already storied history.